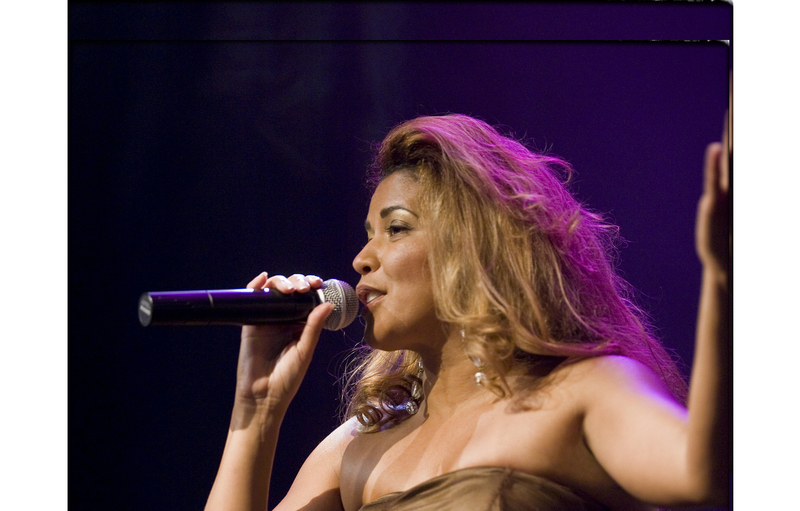 Cintia Rodriguez, born in Rio de Janeiro, loves to taste life from both ends, as most pers ike most persons, who exceed themselves in what they do, she started to sing at a very early age (8 years old) in the choir of the church, that she attended regularly with her parents and her sisters and brothers. At the age of 9 she started swimming and during the following 4 years she won several medals in Rio. Cintia’s passion for dancing made her decide to take up Jazz and Aerobics classes, and in addition to that attended English language courses. Looking back at her childhood, she can only say that it was marvellous and couldn’t have been better. It was she who always made people laugh with her buffooneries and up until today she excels in this “hobby”. As she loved dancing and singing so much, she remained training for hours and hours, balancing her hobbies with her studies. And this lasted until she left Brazil to continue her studies in Europe, where she lives for 21 years now, and where she pursues her career as a dancer, an actress and a singer. Cíntia Rodriguez takes her activities as a dancer, a singer and an actress very seriously ; her career took off in Europe with Banda Mágica, and after several years she has had the opportunity to work on numerous occasions for various TV channels, as in the RTL Late-Night TV- Show hosted by Thomas Koschwitz. In the Harald Schmidt Show, where she performed during several months with her own group Brasil Fantasy, in the TV Total Show hosted by Stefan Raab and with Los del Rios with their hit Macarena. As a main dancer she accompanied Lou Bega with his Mambo Nr.5 hit on his world tour, on all national and international TV shows and collaborated with him in two of his video clips. She started as an actress at age 15 (together with her mother) while making TV commercials for (optical) glasses and swimming pools : she loved being in front of the camera, a place where she feels very much at ease even today. In Europe she successfully proved her talents as an actress in video clips of Lou Bega, of Thomas D from the Fantastischen Vier and of Die Doofen. As of her first years of childhood, she knew that she loved singing, but it was not before her encounter with a friend of the family Domingo Santana (singer and composer) that her talent was revealed at age 14 during her first appearance before a live audience. Numerous appearances in clubs and piano bars followed. When she left Brazil and arrived in Germany, she started off as a dancer and singer with Banda Mágica and other groups, followed after a couple of years as a member of Banda Confetti and Banda Brasil Corcovado. Her career got off in a higher gear with singer Lou Bega, and thereafter she continued as a back-vocal singer for big national and international artists such as Stefan Raab, Anastacia, Lara Fabian and Amanda Marshall. She pursues her solo career as a representative of Brazilian music and continues to “bewitch” her audience with her beautiful and dynamic voice. Since the beginning of July Arco Iris, Cintia’s debut solo-album, is for sale. Arco Iris contains 14 songs of which 11 are own compositions ; Arco Iris means Rainbow in Portuguese. The title refers to the numerous colours and aspects of a country like Brazil, which is a continent on its own, as well as to the different music genres that either have their roots in Brazil or have been imported from Africa centuries ago. The majority of these multi-coloured melodies are represented on this CD. It doesn’t mean though that the result is all roses : Cintia addresses sensible topics of Brazilian society and of the modern western lifestyle as well as problems in the developing countries. It has become a balanced album with a fusion of Reggae, Jazz, Soul, Samba, Ballads and Pop, like the colours of a Rainbow which form a pleasant and lively entity. Arco Iris includes also a cover of Bluesette, a song composed by Toots Thielemans, who has accompanied her with his legendary harmonica on Cintia’s new arrangement of this song. Arco Iris has been recorded in studio in Belgium (Tervuren) and has been produced by Bai Kamara Jr. In her music she expresses, from the depths of her heart, her feelings, her ideas, her dreams and her reality. With her peacefulness and her great joy she succeeds, in a very intensive way, to involve her audience in her musical world. Likewise she participates in the arrangements of certain songs and for her concerts she constitutes her own repertoire, on rare occasions with help of her band. After a pause in her career she founded her own agency Future Entertainment where she dedicated herself during several years to the entertainment industry. Thanks to her large experience in the field, she was able to assist her customers successfully with the design, the organisation and the implementation of various events. She dedicated numerous years to the assistance and visits to homes for elderly people, now she does the same for children suffering from cancer. By singing to them, Cintia feels the joy of these children as well as their smiles. "It is clear that I can not take away their pain completely, nor that I can heal them, at least not in a direct manner, but being in their neighbourhood, and to feel what music does to them, these are unforgettable moments. Every instant that I can live this, is not only a gift to them, but also for me" She also fights against hunger, maltreatment and sexual abuse of/against Brazilian children. She supports Close The Gap (www.close-the-gap.org) which is an international non-profit organization, that actively helps to bridge the digital divide that exists between the West and developing countries. This is achieved by lengthening the life-span of Western IT equipment, which is replaced at an ever-increasing rate, even though it is still more than compatible for current use. Through the use of this IT equipment people in Sub-Saharan Africa, in parts of Asia and South-America get the possibility to acquire knowledge, which is the main driver for economical and social progress. Cintia has had the opportunity to visit the opening of such a project in Tanzania in August 2006 at the Mwereni School in Moshi, where a computer classroom for the blind and visually impaired had been opened with 30 PC’s. She was appointed ambassador of the school. This year she will supervise a similar project for street children in Brazil where three more classrooms in São Paulo, Rio de Janeiro and Salvador/Bahia will be inaugurated.